Words and what not: #divcon - Valerie Sutton found on the #Occitan #Wikipedia. 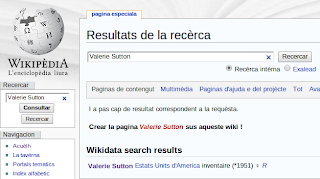 #divcon - Valerie Sutton found on the #Occitan #Wikipedia. Valerie is notable because she invented #SignWriting. SignWriting is a script that enables people to write their sign language. At this moment there is no article on the English Wikipedia for her. There is a shitload of sources in many languages mentioning her achievements, all the material on the SignWriting website is explicitly freely licensed and I am for multiple reasons the wrong person to write her article.. Anyway, one of Magnus's latest hacks allows me to configure my Wikipedia profile with the additional functionality of including search results from Wikidata. The Occitan Wikipedia is my preferred project to experiment with language support from Wikidata. I am really pleased with the result and this hack allows me to find information on Valerie on the English Wikipedia as well.